Throughout the 7 1/2 years that we have lived in our house, we have bounced ALL OVER the place when it comes to home improvement projects. Three years ago, we built a pool, and built a 2400 square foot workshop. We were pretty drained financially, mentally and physically after those projects, so the back yard has kind of just sat since then. Given that we live on an acre, there was still a ton of area to fill with landscaping. With two growing boys who are active in sports, and a neighborhood full of kids who are often over to play, we knew it was time to finally get started on it again. 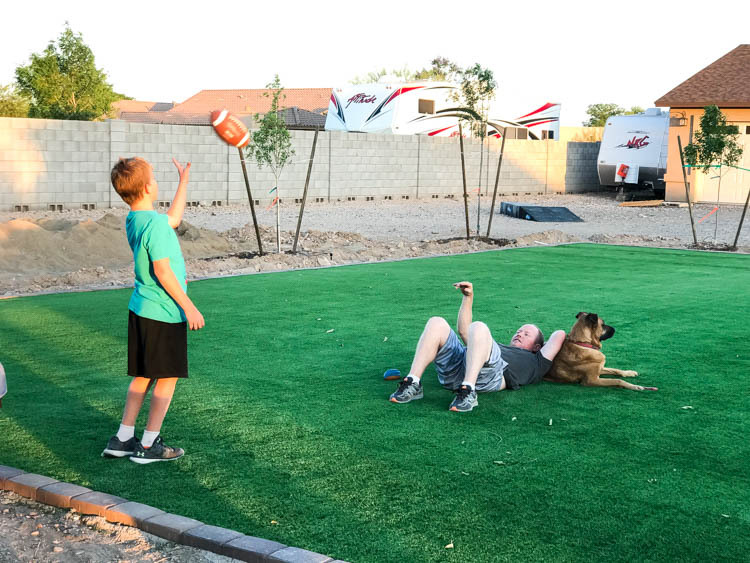 Today, I’m partnering with Select Surfaces to share with you the massive improvements to our back yard over the past month, and also share why we chose artificial grass for our yard. There is a night and day difference between what our backyard looked like a month ago and what it looks like today. One of the big things is that we planted 20 trees throughout the yard. The real star of the show, though, is the 1500 sq ft of artificial grass that we had installed. The grass is Select Surfaces brand from Sam’s Club. You may have seen the 3’x13′ rolls they have in their stores, but you can also order it online in larger sections and quantities. We ordered two 15’x50′ rolls and had them dropped right in the back yard by the delivery company. The artificial grass from Select Surfaces has a great look and feel to it, which was very important to us, given the large area it would be covering. We didn’t want it to LOOK like artificial grass. 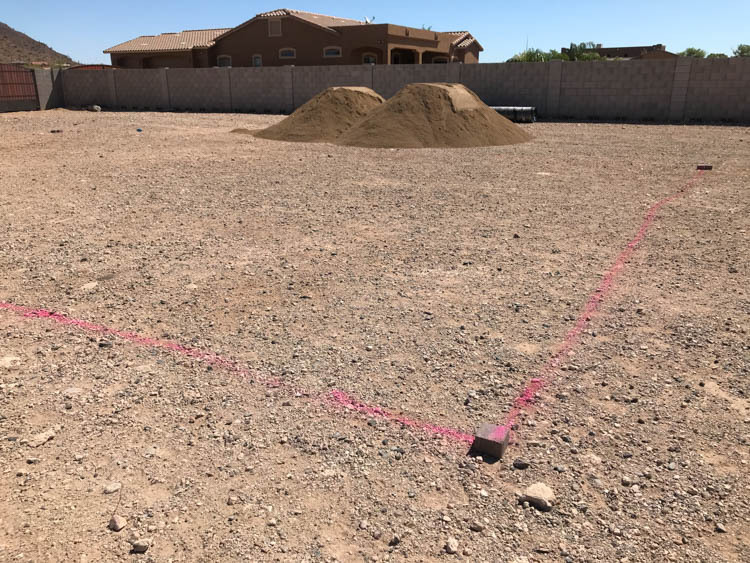 Here’s how our yard looked before the grass was installed. Like I said, we hired a company to install the grass for us. 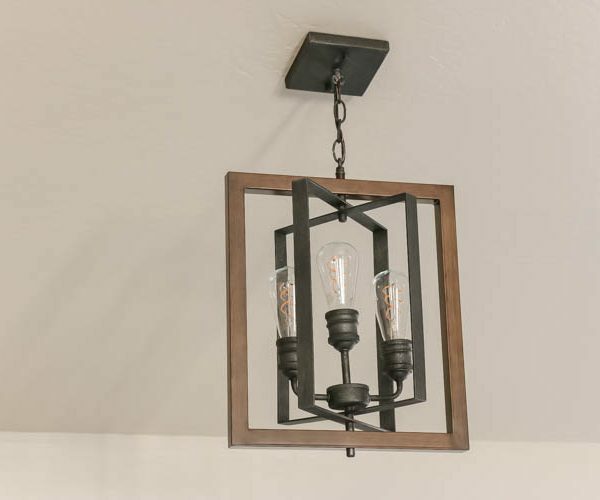 My husband and I both have insane schedules, so we knew that it would be better for us to have such a large area installed by professionals. The day of the grass install was a pretty exciting day for us. Unfortunately, we missed most of it due to our oldest son’s soccer tournament. When we left for the tournament, they had only started on the paver border. By the time we got home that afternoon, we were met with a glorious, green lawn! We were blown away by how incredible it looked. We loved the look of the grass so much that it got me thinking about other areas we could install grass. I knew that inside our pool fence would be perfect. There was a larger area on the back side of the pool where I knew the kids would absolutely love to be able to hang out and dry off after a swim. This time, we decided to install the grass ourselves. 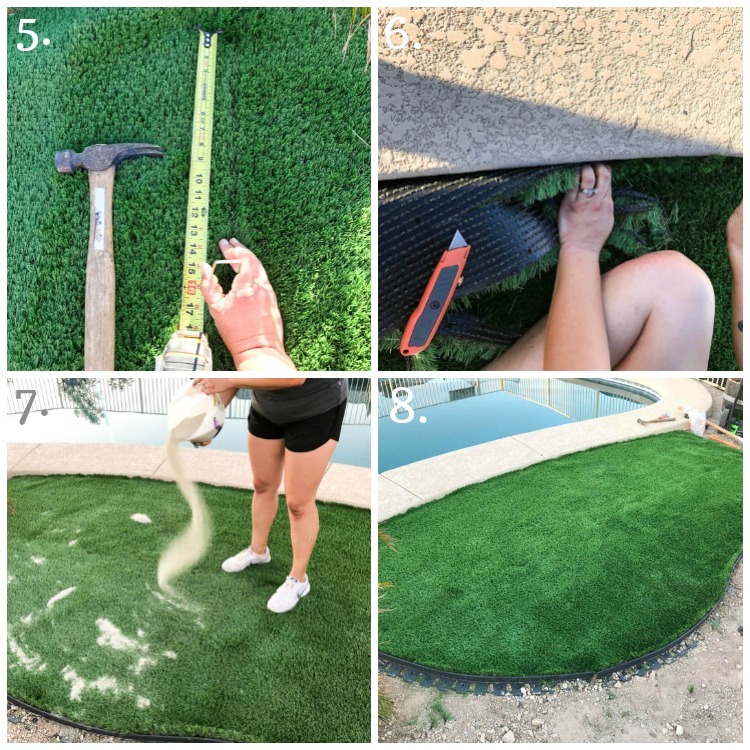 Thankfully, Select Surfaces has a helpful video tutorial on how to install the artificial grass, so we got to work. 1. The first step was preparing an area for the grass. I purchased heavy duty plastic borders from Home Depot, and created the shape of the grass. 2. There was a ton of 1/4 minus left over from the original grass install, so I loaded up the wheelbarrow a few times and dumped it into the border area. I should note that I missed the step of putting down a weed barrier before the 1/4 minus. In the process of doing all of this, I mixed up the steps and thought the weed barrier went on top of the 1/4 minus. It is actually supposed to go under it. Needless to say, I had to omit that step. 3. I carefully spread the 1/4 minus throughout the bordered area, then sprayed it with water and used a handheld tamper to compact it. If you’re doing a large area, you’ll definitely find that renting a motorized compactor will suit you much better. 4. I purchased two rolls of grass from my local Sam’s Club store and rolled them out over the area. 5. Once I had the grass laid out over the border, I lined up the seams and staked them in place with the included stakes. 6. I then took a sharp razor knife and cut away the excess around the edges. Once that was finished, I nailed stakes all around the border of the grass to hold it in place. 7. I didn’t have a spreader for the silica sand, but with such a small area, it wasn’t really necessary. Instead I grabbed a bucket and spread the sand by hand. 8. While I was spreading the sand, my husband used a push broom to brush it into the grass. The silica sand not only acts as a weight to hold the grass down, but it also helps the blades to stand upright. We used about 125-150 pounds of silica sand on this 12’x6′ area. The end result was a great little grass area for the kids and dog to hang out after their done swimming. They’re all loving it, too! Obviously the area isn’t completed yet, but we’re waiting until fall when the weather is cooler to spread landscape rock. 1. We live in the desert. Being in the desert, we obviously don’t get a lot of rain. We also live on a well. Yes, we do have a pool; however, we still wanted to try to conserve water in other areas of our landscaping. 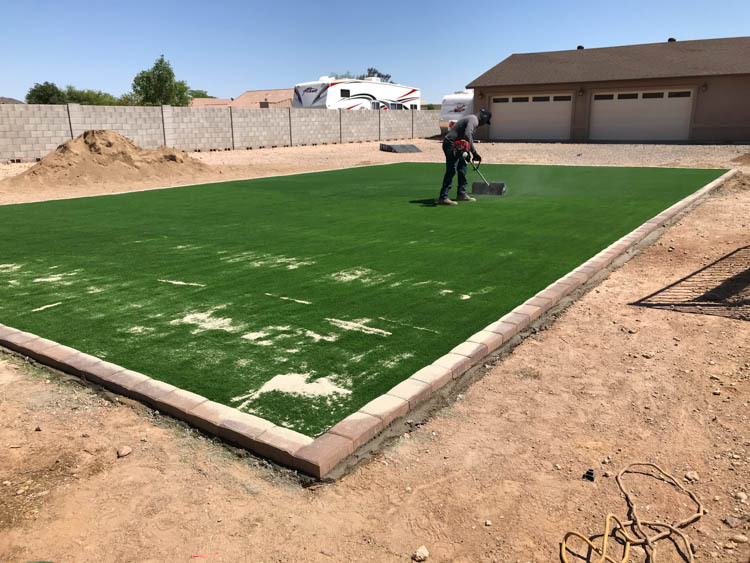 Artificial grass is a larger investment up front than the real thing; however, the time and money we will save in maintaining it will far outweigh the initial cost. Installing the irrigation lines, maintaining the sprinkler system, replanting winter and summer seeds, etc. all take a lot of time and money. Not to mention having to mow it every week. Again, we live in the desert. There’s no shortage of critters running free throughout the neighborhood. Our next door neighbors constantly have a pack of bunny rabbits in their front yard that scatter every time we drive by. That and the snakes. I’m deathly afraid of them. If I were mowing the grass one day and kicked up a snake, I can tell you that it would be the very last time I ever mowed our lawn again, or set foot on the grass. As I said before, the day the large area of grass was installed, I left when we still had nothing but dirt. I returned home to a lush, beautiful lawn. The same went for the small little area by the pool. In a matter of a few hours, we went from barren dirt to a beautiful, grass area. But does it get hot? Yes, it does get a little warm on our feet during the heat of the day, but I just grab the hose and give it a quick spray with water and it cools it right down. It obviously doesn’t get brutally hot, because I’ll still find Dakota laying on it in the middle of the day. She did that even when we had dirt, so obviously she loves sunning herself. How do you clean up after your pets? 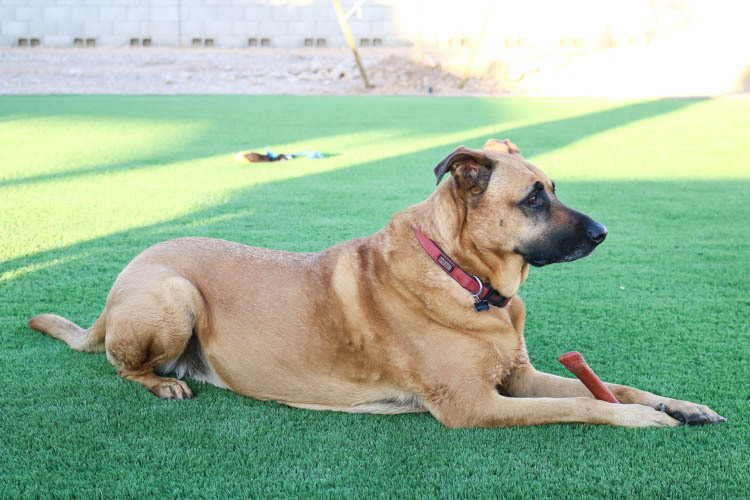 Artificial grass is really popular for pet owners, but it does need to be cleaned if your pets use it as a restroom. Obviously poop needs to be picked up regularly, but you’ll also want to use a natural cleaner to spray the grass from time to time to also disinfect it and remove any odors from urine. From my research, Simple Green seems to be a popular choice. Depending on how many pets you have and how often they relieve themselves on the grass will determine how often you have to clean (between weekly and monthly). The biggest reason I am so excited about our new yard is just how much it’s improved our quality of life as a family. I know that sounds silly, but it really has! For starters, Dakota (0ur four-legged daughter) absolutely LOVES the grass. Every time she’s outside, you can find her laying on it, chewing on one of her toys or just napping. The boys are constantly playing together and, on any given day, you can find half of the neighborhood over playing a game of soccer or just running around. With it being summertime, I’ve actually found myself telling the kids to come inside out of the sun and just play video games for a while. Something I NEVER thought I’d be saying. 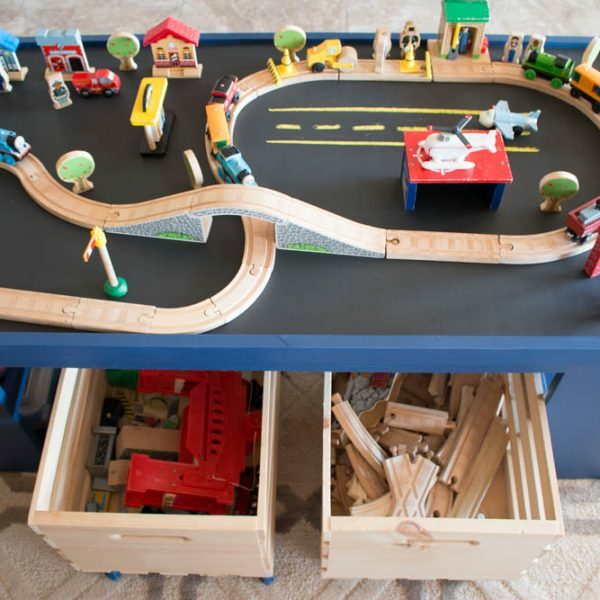 I knew that the kids would enjoy it, but I had no idea they would be so excited to constantly be playing on it. It makes me wish we had done this years ago. We love playing outside now as a family and throwing the football or kicking the soccer ball around. 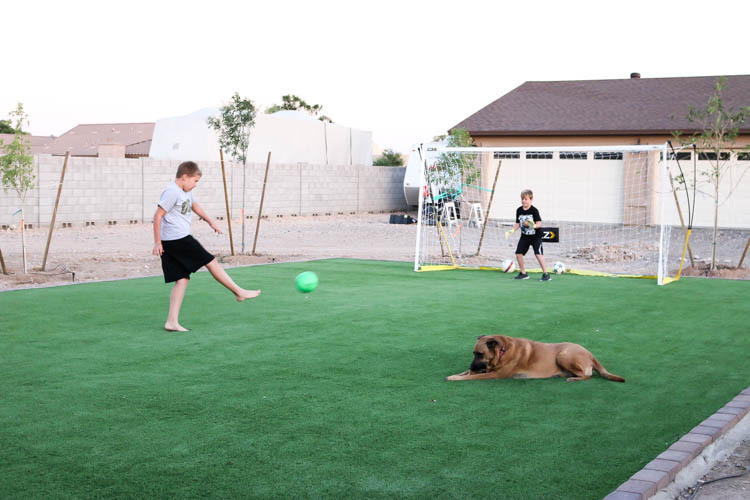 If you’ve been wanting to install grass in your yard, I highly recommend installing artificial grass. 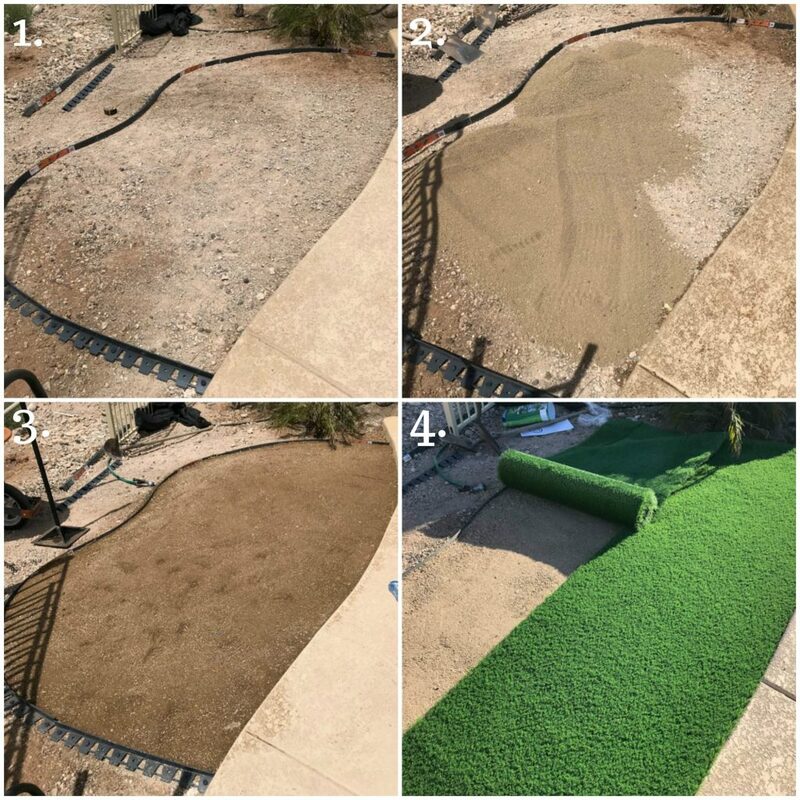 We’ve been so happy with the quality of the Select Surfaces grass as well as the ease of ordering it online and also being able to pick it up in the store. We are definitely looking forward to enjoying it for years to come. 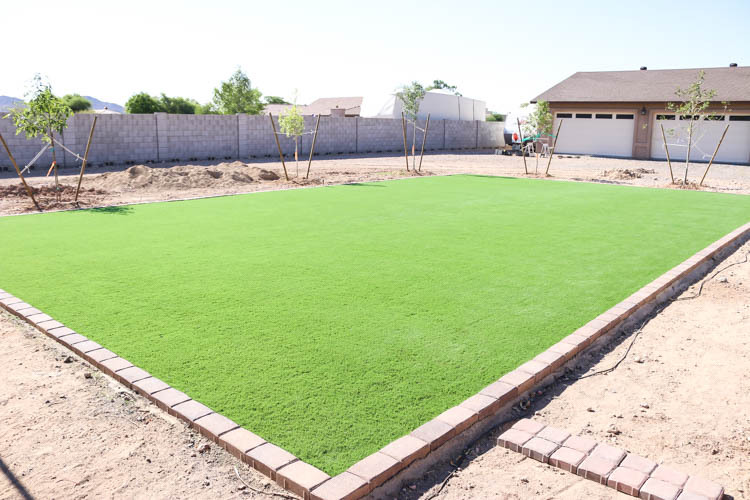 We also live in the Desert and also installed artificial grass. I love it… Have you had any issues with pet odors though? Our dog potty’s on the grass and while we are good about rinsing it off we find that when it’s hot that smell kicks up in the wind. Any solutions? 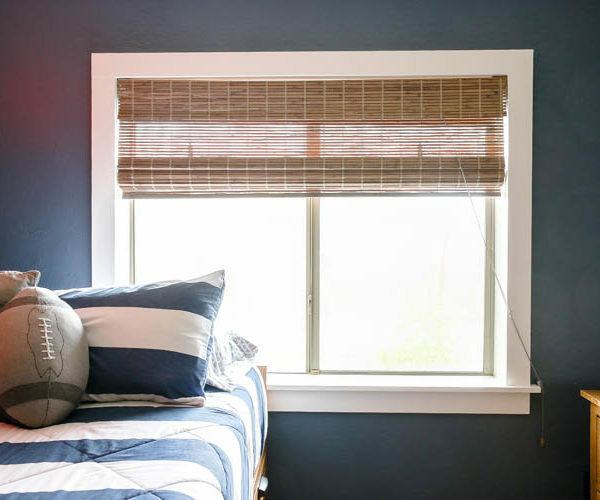 We’ve used an outdoor pet odor solution from Simple Green but it’s not a perfect fix. For us, we actually trained ours to not go on the grass. I know that is not an alternative for everyone, though, as not everyone has an alternative area their pet can go. From what I was reading, a solution of simple green and water sprayed well over the grass should help. I just don’t have any experience with it personally. It looks amazing! I love the idea of not having to mow it! Did the company give you an idea of how long it will last before you need to replace it? As I get older this seems like a great idea from a maintenance standpoint. Hi Giselle, I’m not entirely sure how long it will last before needing to be replaced. I know that they have a 10 year warranty on the grass, so I have to imagine it will last beyond that. 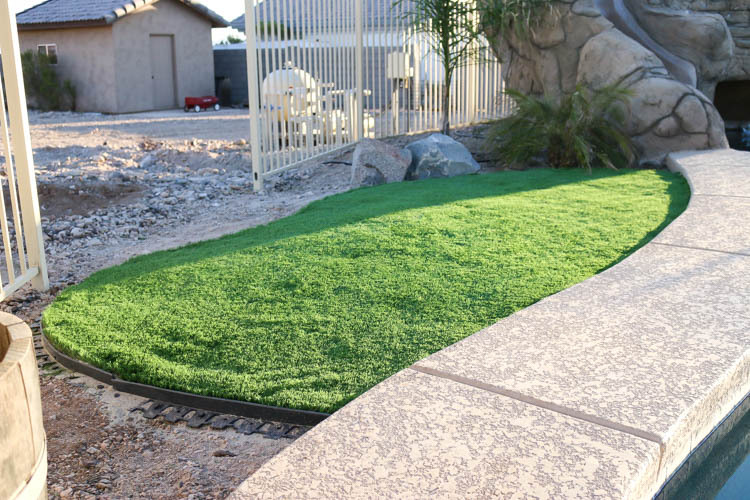 I had never thought about artificial grass before but now I’m seriously considering it! We’re doing a huge reworking of our yard and we need to decide what to do about the grass soon. We’ve just installed a new fence and so grass is the next step for us. Thank you for this thoughtful breakdown of the pros and cons! You’ve certainly given my husband and I something to talk about! I also live in the metro Phoenix area. Highly allergic to grass & tired of looking at all xeriscaping. This looks very natural, & the installation seems pretty straightforward. I’ll get this done in the fall, after the heat settles down. You’ll definitely love it! We have zero complaints!